HAPPY NEW YEAR! 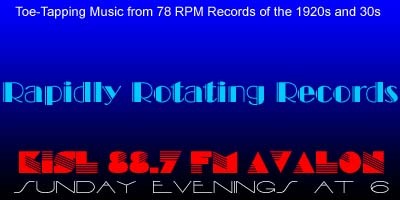 This is the first Rapidly Rotating Records broadcast of 2019! I hope you had pleasant holidays and that the new year so far promises to be a good one for you. It certainly does here at the massive Rapidly Rotating Records / KISL-FM studio complex. This week we’ll celebrate the birthdays of James Melton, Jane Green, Carroll Gibbons and the state of Georgia. We’ll also have a “non-topic” topic. What’s that, you ask? Well, records I came across while putting the play list together out of which I couldn’t make a unified topic. Unlike our feature “For No Particular Reason,” there is a reason I’m playing each of them, and of course, you’ll find out just why that is. Do I Hear You Saying “I Love You” – Fred Rich and His Hotel Astor Orchestra / James Melton, v.
THe Song Is Ended (But The Melody Lingers On) – The Columbians / James Melton, v.
You Are Love – Victor Young and His Concert Orchestra / James Melton, v.
Me And The Boyfriend – Nat Shilkret and The Victor Orchestra / Jane Green, v.
If I’d Only Believed In You – Leroy Shield and The Victor Orchestra / Jane Green, v.
Got No Time – Nat Shilkret and The Victor Orchestra / Jane Green, v.
So Rare – Carroll GIbbons and The Savoy Hotel Orpheans / George Melachrino, v.
Turn Your Money In Your Pocket – Carroll Gibbons and The Savoy Hotel Orpheans / Sam Browne, v.